Education is under attack like never before. FE colleges have closed, jobs have been lost and students are being forced deeper and deeper into debt by a government happy to see companies making profit off the back of student poverty. It’s time to take a stand. 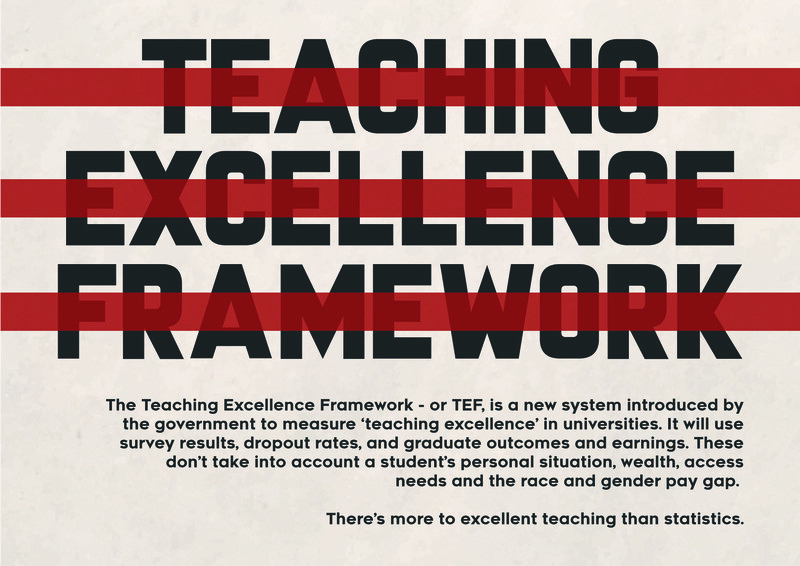 The Teaching Excellence Framework – or TEF is a new system introduced by the government to measure ‘teaching excellence’. ‘Teaching excellence’ will be measured using student survey results, dropout rates and graduate outcomes and earnings which don’t take into account a student’s personal situation, wealth, access needs and the race and gender pay gap. Universities will be given a rating of bronze, silver or gold according to how well they score in the TEF. How well a university scores will affect how much they can charge in tuition fees. The higher they score, the more they can increase their fees. Taking part in the TEF is optional and so are the fee increases. But so far the University of Salford has indicated that they will be increasing fees if they can. We think that excellent teaching is more than just statistics. We want to know, what do you think excellent teaching is? Is it a lecturer that tells great jokes? Or great lab facilities? Or getting a high mark on an assessment? After we have collected your feedback we will present it to the University so they know what their students think excellent teaching is.